Inspired by Artwork was an easy prompt for me, that's because I had printed off these temporary tattoos months ago, and just not got around to trying them out. The art work I chose is the Bird and Fish design by M C Escher. 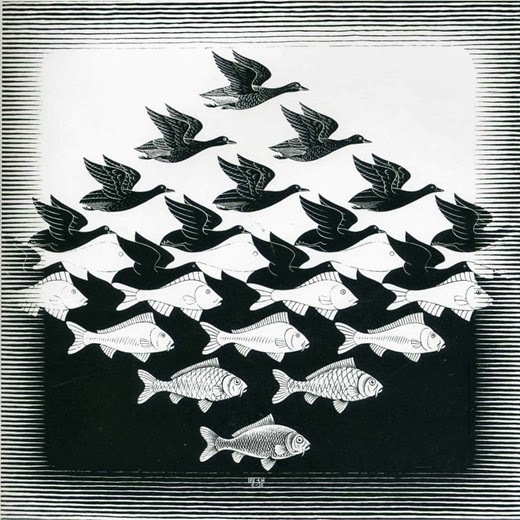 It's an optical illusion that starts with birds flying at the top and transitions through to fish swimming at the bottom. This is the perfect sort of design to use temporary tattoo paper with, because the images are so fine and delicate that you could never paint them free hand. As you can see, my printed tattoos were transposed onto my nails, making them fly and swim the other direction. 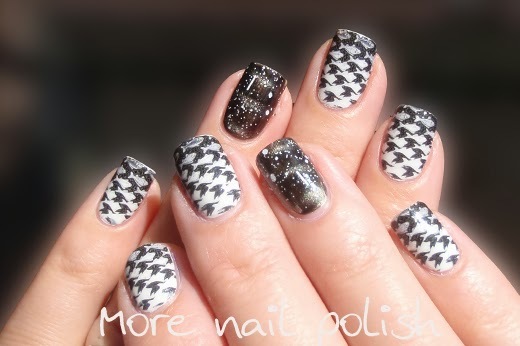 From a distance, these nails looked like a gradient, black and white hounds tooth design. I painted an accent nail using Layla Black Metal magnetic polish topped with Peneople Luz Wedding Dress - which is a glitter topper with various matte white glitters. Ladies, I can see the light at the end of the tunnel for the challenge - don't you all feel like that last 27 days have just flown by? I thought these are stamping at first, haha, love them!! These are so cool! I thought they were houndstooth at first and then saw the birds and fish after I started reading the post. Isn't Escher's work just the bomb? I have a print of Hand with Reflecting Sphere in my living room that is just fascinating. Outstanding work ... is there a special kind of paper or film that you use in your printer to do the temporary tattoos? I use temporary tattoo paper I purchased off ebay. I just print on it using our cheap ink jet printer at home. The paper isn't cheap, but you can get so many designs on an A4 sheet. Thanks for that... I'll do a search and find some. And I promise not to blow off practicing my freehand skills. ;-) Cheers! I love M.C. Escher. Reminds me of Labyrinth. :) The magnetic nail looks rad. Such a cool mani! Love the print!